A Kamloops hockey tradition is celebrating its 25th year this weekend — and it’s a tradition that’s travelled far beyond B.C. 's Thompson region. A Kamloops hockey tradition is celebrating its 25th year this weekend — and it's a tradition that's travelled far beyond B.C. 's Thompson region. 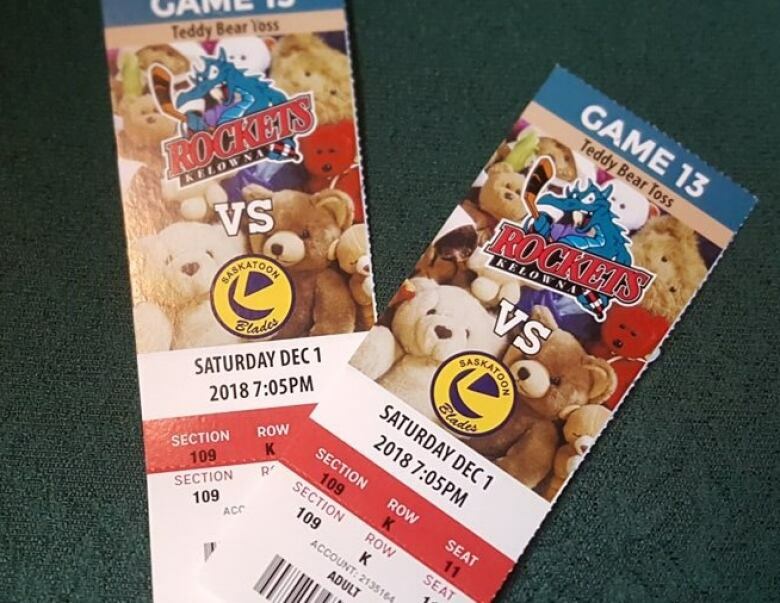 Western Hockey League teams will hold Teddy Bear Toss events within the next few weeks, a tradition where fans toss stuffed animals onto the ice for donation to local charities. The toss has humble beginnings at a Kamloops Blazers game during the 1993-94 season when the club's then public relations director Don Larsen came up with the tradition. Kevin Rhodes is the current president of the Kamloops Blazers booster club, which collect the bears. "Good things go a long way," said Rhodes. "It's good for the organizations that benefit in the community… People want to be involved in that." Rhodes said the goal of the first toss was to round up toys for children's charities during Christmas time. These days, the events are held in major-junior hockey rinks across Western Canada, and the toys go to children and also seniors in hospital for comfort during challenging times. The teddy bears get thrown onto the ice when the home team scores its first goal of the game. The first teddy-tossing tally was scored by Brad Lukowich, assisted by Darcy Tucker and Shane Doan. All three would be drafted into the NHL and enjoy decades-long careers. It's not clear if their teddy bear heroics weighed into scouts minds when they were selected, however. On today's Blazers, excitement is high for the 2018 edition of the toss — and to see who will notch the all-important goal. "There's pressure, for sure. Everyone wants to be that guy," said winger Ryley Appelt, 18. "If you're the lucky guy to score it's pretty unreal but just to be a part of it is great." Likely no player knows that better than defenseman Montana Onyebuchi, also 18. He scored a teddy bear-tossing goal last year as a member of the Everett Silvertips. "It was awesome. There was like, 8,500 teddy bears on the ice," Onyebuchi recalled. "It's better than scoring any other goal I've ever scored, ever." Of course, there is the possibility that the home team is shut out. In cases like that, the crowd generally tosses them, sadly, onto the ice at the end of the game. The Kamloops Blazers will hold their teddy bear toss event Saturday when they take on the Seattle Thunderbirds.